It’s here folks. 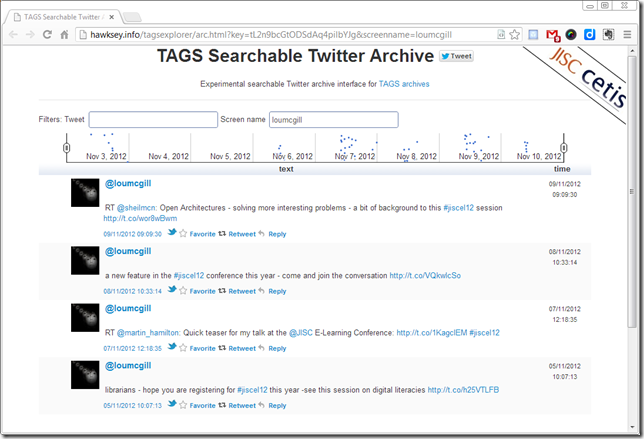 The most advanced aggregation and visualisation of tweets for the JISC Innovating e-Learning 2012 online conference taking place next week. 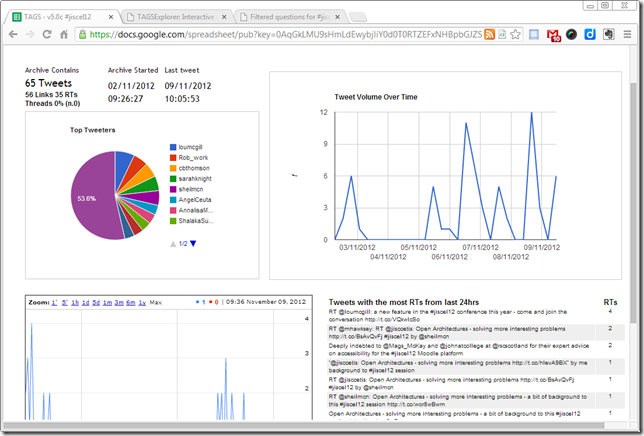 Over two years ago I started developing a Google Spreadsheet to archive tweets and since not only have I been evolving the code I’ve been creating tools which use the spreadsheet as a data source. 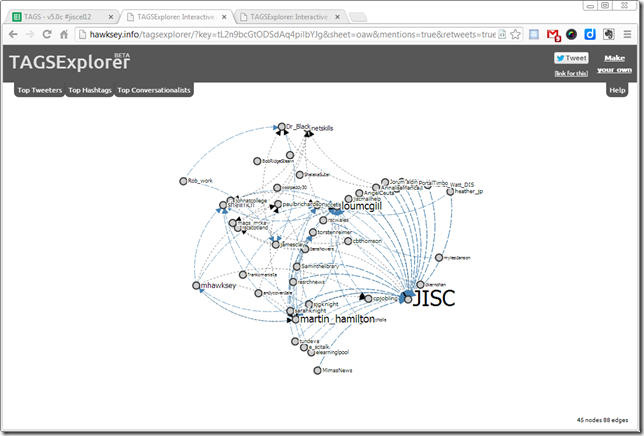 It’s pleasing to see these tools being used for a wide range of projects from citizen journalism, to a long list of academics, students and community groups, and even TV broadcasters. I’ve been a little remise in posting some of the latest developments and I’ll have to cover those soon. 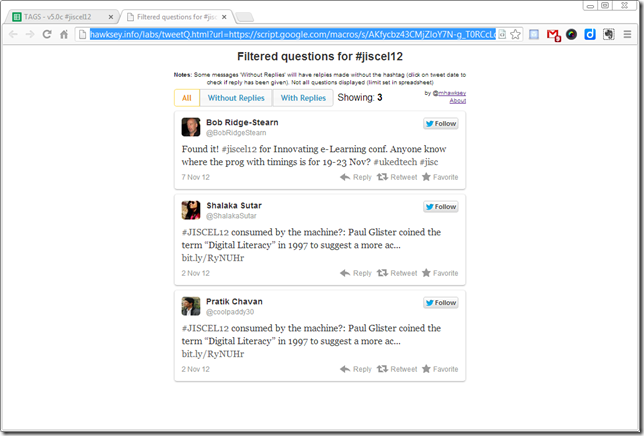 For now here’s your #jiscel12 Twitter basecamp. fab work Martin will be very interesting to watch over the next two weeks. This looks great! 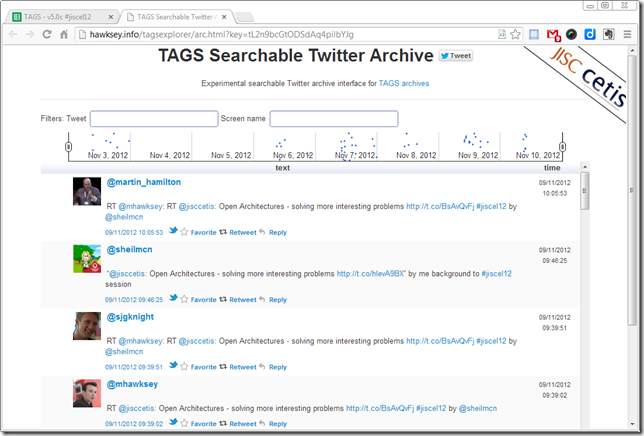 Particularly like the filtering additions to the archive. When will we be able to use version 5.0? Thanks Martin, will take a look. Happy to wait for the new version – like I say to my Linkedin trainees, little and often means always improving! Interestingly, interactive features don’t work on iPad (at least not in Safari). Will explore later on my lap top. It’s also interesting to see the clustering of my tweets around November. I wonder what happens then? I’m a loyal reader of your blog, and thank you for contributing your knowledge in such an amazing way (at least for me, who really admire your works and your skills). Thanks to you, TAGS and TAGSExplorer become part of my everyday work, and following your Scoop on Google Scripts help me to discover interesting ideas. Well, today I’m writing to ask for your help. 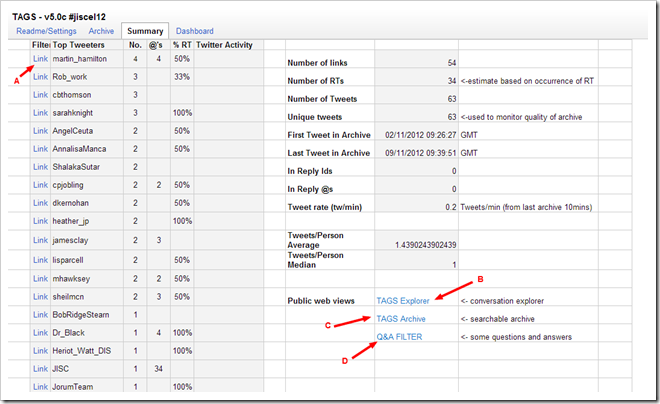 I want to build a similar tool like TAGSExplorer for my social monitoring application. I know it’s a bit sensitive, and if you accept or not, I can understand and still be your loyal follower. Thanks for your time, anyway! Such a great pleasure to know you!